I’m really really in love with Google at the moment. The kind of unhealthy love that one person can have with a mega-corp at the other end of a modem. At work we have a lot of display homes at different locations all over Melbourne and soon into regional Victoria, having to draw the maps for each of these locations take a lot of time I don’t have, and they end up looking a little crap in the end. Enter Google Maps, which started to include Australia just a week ago. It’s amazing, the street maps are nice and close and even include land allotments (though I’m not sure how accurate they are, they appear to be right for our estate). So after a small frustration, we now have them integrated in our site at work. 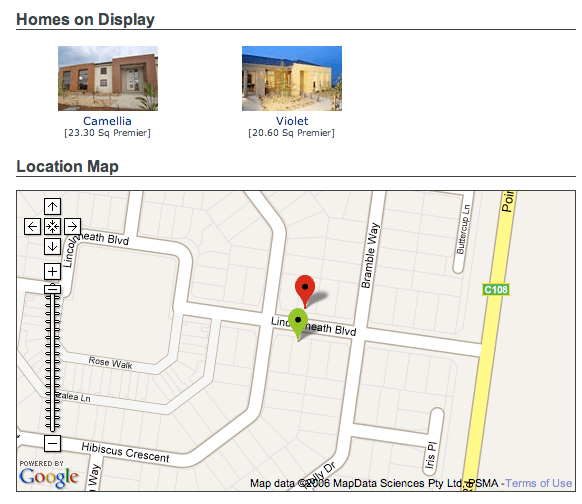 Check it out at www.burbankhomes.com.au/display_locations.php.